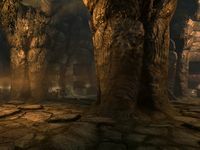 Solitude Catacombs is an area occupied by undead which can be accessed either via the Hall of the Dead in Solitude or directly from the city. The catacombs are in the building behind the Hall of the Dead, with an underground doorway linking the two. There is a small graveyard containing a dozen gravestones outside in front of the entrance, with two nightshade plants among them. There is a short flight of stairs down to the door. Entering from the outside, you find yourself at the top of a flight of stairs heading northwest, with a typical Nord catacombs ahead. There are many hanging mosses growing from the walls throughout the catacombs, with many ingredients being left as offerings in addition to loose coins and a couple of bottles of Nord mead. Standing at the far end by a junction is a melee fighting skeleton. The path splits to the northeast and southwest, before both path turn back to head northwest again and climbs stairs. At the top of the stairs both paths turn turn again to complete a square. In the top corners are two more melee fighting skeletons. At the other end of the catacomb, directly opposite the entrance you came in via is the second entrance from the Hall of the Dead. The burial urns found here are unique to this location, however they are all empty. 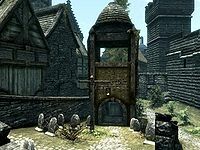 After Roggvir's execution, his body will be buried here in accordance with Nord tradition at the request of Styrr, priest of Arkay. In the quest Bound Until Death, if the corpse of Vittoria Vici disappears from the wedding location quest area due to player fast traveling or for another reason, it can subsequently be found in the catacombs.